Cabinet refacing is increasingly becoming one of the fastest growing segments of the remodeling industry. With cabinet refacing, your kitchen’s current cabinets remain in place. Instead of removing the cabinets, we replace your doors and drawer fronts and cover the remainder of the cabinets with panels and trim. Clients love cabinet refacing because it requires no tear out, and you can continue using your kitchen or bathroom throughout the length of the project. When it comes to attaining a new look for your kitchen, cabinet refacing is an ideal solution. Because your existing cabinet boxes stay in place, you can select what other changes you want to make. Cabinet refacing is efficient and minimizes any disruption to your family’s daily routine. There is no need to remove your countertops, flooring, kitchen supplies, or appliances; we work around everything. With Republic West Remodeling’s cabinet refacing, we provide solutions to extend, add, or modify your current cabinets in a variety of ways. Our design team reviews all of the options with you to help you create a kitchen that works for your needs. Cabinet refacing projects can also be a part of a larger kitchen remodel or bathroom renovation project. 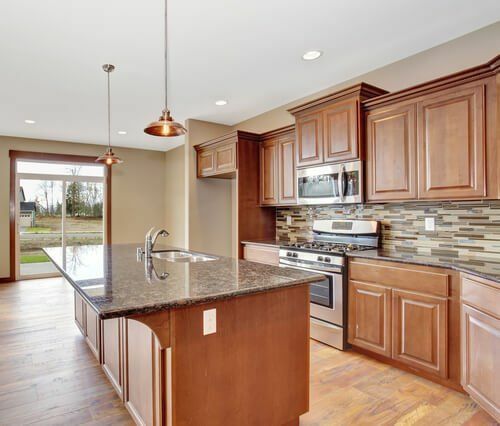 At Republic West Remodeling, we can completely remodel your kitchen and help you choose between cabinet refacing or brand new kitchen cabinets. Schedule Your Free Cabinet Resurfacing Consultation Today! Contact us today for the highest quality cabinet refacing in Phoenix, Scottsdale, and the Phoenix Metro area. Call (480) 428-2695 for your free consultation or contact us online.